Ok, I cheated. I actually did this on Saturday, but it’s the manicure for the week. 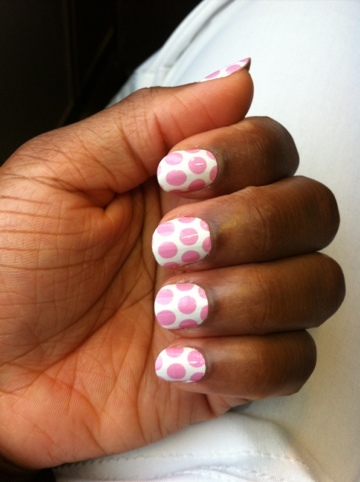 It’s Sally Hansen Salon Effects in Pink-a-dot. This was an Easter design that I bought but haven’t used until now, so you likely wouldn’t find it in the store. Loved it in the packaging, but not my favorite design on my hands. It’s here for the week though. Thanks! I guess everyone likes it more than I do. I got a lot of compliments on it today. Hey Rece, are those stick on nails? Nope. Just a design. Sally Hansen Salon Effects. Google it. You should try it.